UK Automotive has enjoyed unprecedented success in recent years – car manufacturing is at its highest level since 2000 with 1.7 million cars built in the UK in 2016, an 8.5% uplift on 2015. Exports, too, are stronger than ever, with automotive accounting for 12% of total UK exports in goods, and the UK’s supply chain is increasingly competitive with cars built in the UK now having over 15% more UK content than they did five years ago. However, the automotive sector is on the cusp of dramatic change because of technological advances and the UK’s withdrawal from the European Union. The next five years will be a defining period for UK Automotive. 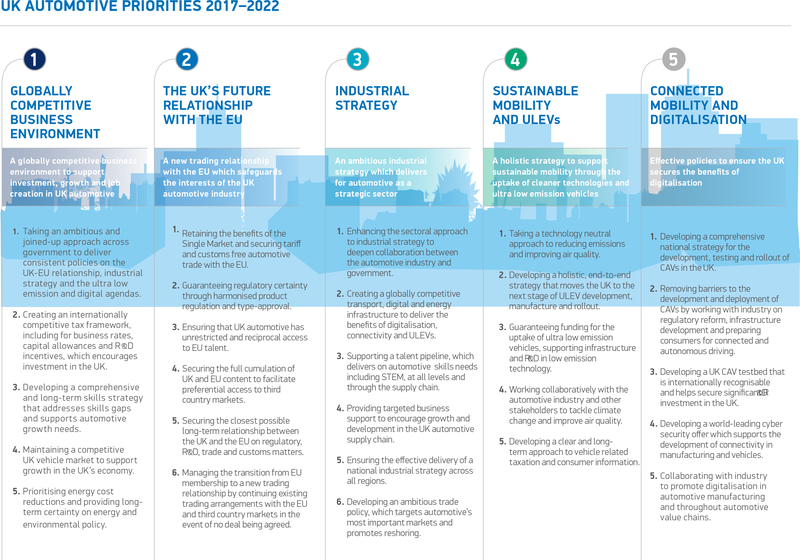 If it is to continue to thrive and sustain its ambitions, the industry, government and Parliament must work in partnership to develop and deliver the policies automotive needs to succeed. SMMT has five key priorities that should be addressed in the new government. To read more about our priorities for a new Parliament, view the report in full.